If you have sheep lovers in your life, think about crafting a cute little amigurumi sheep that is sure to warm their hearts. The art of amigurumi is Japanese in origin and involves crocheting or knitting an animal in pieces and assembling it at the end. 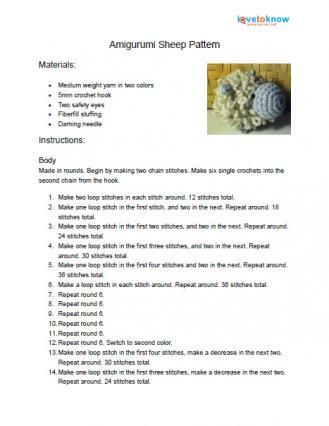 The following pattern uses this technique to create an adorable, cuddly sheep. Sure to be a hit with both young and old, this pattern is best suited for an intermediate crocheter and is worked in rounds. To download the pattern, click on the image to open the .pdf file in a new window or tab, depending on your computer's settings. From there you can either download the pattern or print it out. Don't forget that you will make your sheep in pieces and assemble them at the end, so make sure that each piece will fit with the next one as you count your stitches. Don't skimp on stuffing. The cutest amigurumi figures are stuffed to the brim, making them firm yet still cuddly. 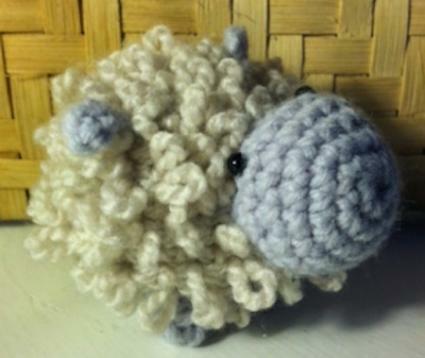 You will have so much fun crafting this sheep that you will want to make many more amigurumi items. Once you become familiar with the process you will be able to make these little guys pretty quickly. Don't forget to keep one or two for yourself!